Carved into the Biblical mountains near Moab, sits an ancient Jordanian city named Petra. From the depths of one woman’s soul and the soft red stone of the middle east, emerges an energetic link to the past and many future conversations with the Goddess. Little did Dorothy Atalla know when she first visited this mystical place while on a family vacation in the 1970’s, that her travels had only just begun. Seven years after returning home from that trip, she experienced her first encounter with the Goddess while meditating, beginning an inner journey that transformed her life and empowered her both physically and spiritually. Recently released, Conversations with the Goddess: Encounter at Petra, Place of Power, is the first in a series of books about Dorothy’s dialogues as well as the connection every woman has with the divine feminine. Moving between present day and ancient times, we are launched on a spiritual journey to seek answers that potentially free us all from inner conflict, encouraging awakening women the world over to embrace the prominent roles they will play in the evolution of humankind. As the story unfolds, Dorothy evolves, and her interpretations about being female shift rather dramatically. She embraces the fact that her body is not separate from spirit and recognizes that her place within the spiritual intentions of our planet are vast, spanning the expansive time line of Earth’s evolution. With this re-membering, she invites readers to understand what it means to be part of the universal story of the divine feminine which continues to weave through us all in our daily lives. “There will be a new global spirituality in which great numbers of people will experience me directly. Peoples’ thinking will change. When thinking changes, society changes,” says the Goddess in Dorothy’s journey. This is what we have known, what we have been awaiting for thousands of years. It is a time of balancing the masculine and feminine archetypes by honoring the divine feminine in all human beings. 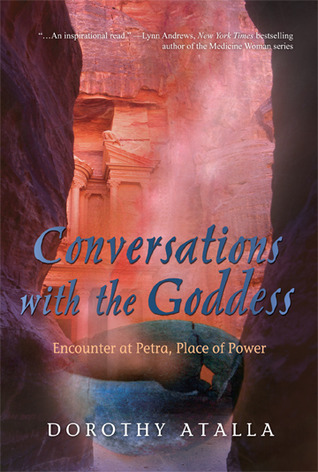 Conversations with the Goddess: Encounter at Petra, Place of Power is available at Amazon.com. Feel free to visit Dorothy Atalla’s website too for more information on her programs and writings.